Note: Those interested in crewing, volunteering, learning to sail, improving their sailing, or recreational sailing events should start on the Fleet 15 Introduction page. Briefly, Fleet 15 is a one-design fleet of daysailers racing on Sundays at Orleans Yacht Club (OYC). All international sailboat racing is governed by The International Sailing Federation (ISAF). To keep racing rules consistent the sailing organizations known as national authorities within various countries base their rules on the ISAF rules. In the US, the sailing national authority is US Sailing. See the Racing Rules page for complete racing rules. Racing which involves a single boat type is known as one-design racing. 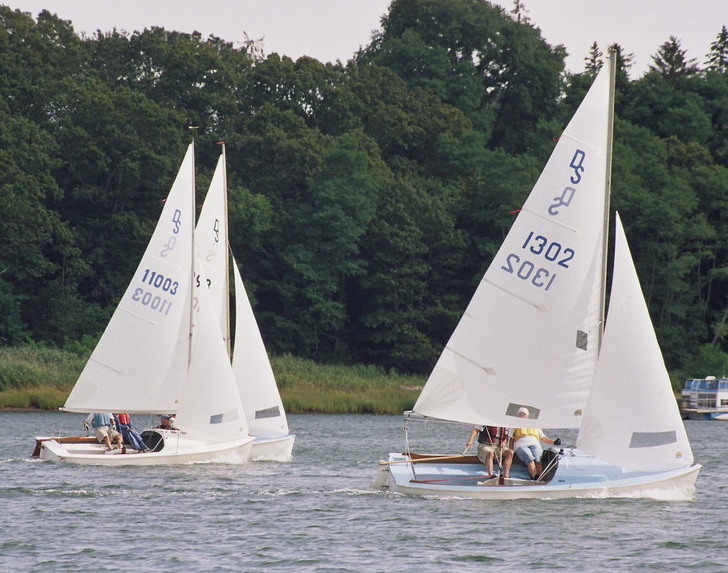 This type of racing is governed by a one-design class association which defines the weights and measurements that a boat must conform to in order to race within that class. Multiple manufacturers can make boats of a given class as long as the boats meet these specifications. 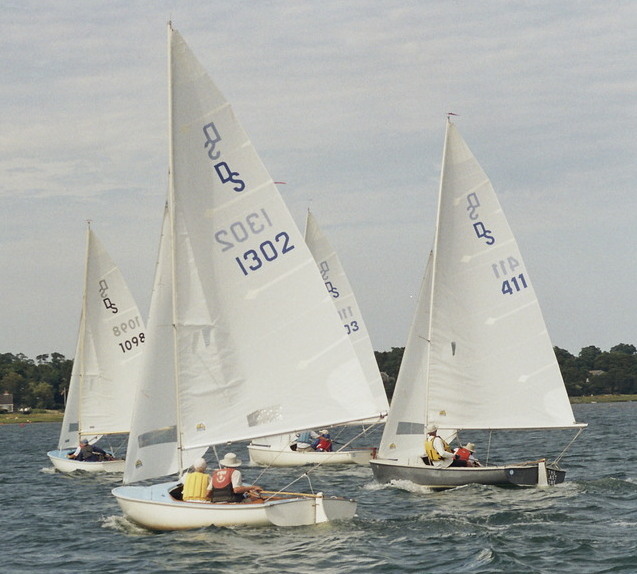 One design classes allow local groups to create a one design fleet if they intend to race boats of that class, often with a yacht club hosting the fleet. Fleet 15 is a Daysailer Association fleet. The daysailer is a boat originally manufactured by O'Day beginning in 1957, and often called the O'Day Daysailer for that reason. Orleans Yacht Club (OYC) hosts the Fleet 15 racing. Though Fleet 15 is part of the Daysailer Association (DSA), there is no requirement for racers to be DSA members. Fleet 15 racers are encouraged to join DSA. To sail in DSA sanctioned events such as regional championships and the North American Championship, sailors must be DSA members. A Fleet 15 member could be considered a member of DSA who has indicated that they are part of Fleet 15 on their application to DSA. A Fleet 15 member could also be considered any sailor who races with Fleet 15. The more important question is who can race in Fleet 15 races. For a skipper to sign a boat up for racing in Fleet 15, they must either be a full OYC member, or join as a "Racing Associate Member" for a small fee. For this reason, Fleet 15 is also often called OYC Fleet 15. The daysailer is raced with two people aboard, the skipper and the crew. There is no requirement for crew to be an OYC member. If not an OYC member, the crew is considered a guest of the skipper, who must be at least a Racing Associate Member. Any person 21 years of age or more, who owns or has use of a class sailboat currently raced at the Club or is a crew member, may apply for a Racing Associate membership when sponsored by two (2) Club members in good standing. This membership entitles the Racing Associate to participate in Club sponsored Sunday races, use of the Club facilities during the racing season and participation in Sunday night Fleet 15 cookouts. The annual dues for a Racing Associate membership is currently $50 per year. Racing Associates have no voting power at the OYC annual meeting. Interested skippers can learn how to sign up for Fleet 15 racing on the Forms page. Then refer to the Race Schedule page, the News page and the Calendar page.